Smith is one of the best prospects on the hoof in this class. 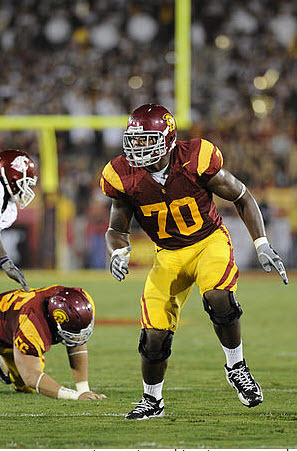 Blessed with an ideal NFL frame and has the outstanding feet and athleticism necessary to be a starting left tackle. Does a great job staying in front of speed rushers, locks on and sustains, and can anchor against the bull rush. Shows solid power in the running game and is really productive out in space. Football IQ is lacking. Fails to find his target at times in the running games and is a tick slow recognizing blitzes. Smith could come off the board early in the first round due to his rare physical gifts.